Airflow in a pipe tends to travel in the outer edges of the pipe. Hard piping like Evolution Racewerks' TIC charge pipe keeps the inner diameter of the constant and prevents it from ballooning or collapsing. The results? Better throttle response and decreased turbo lag! 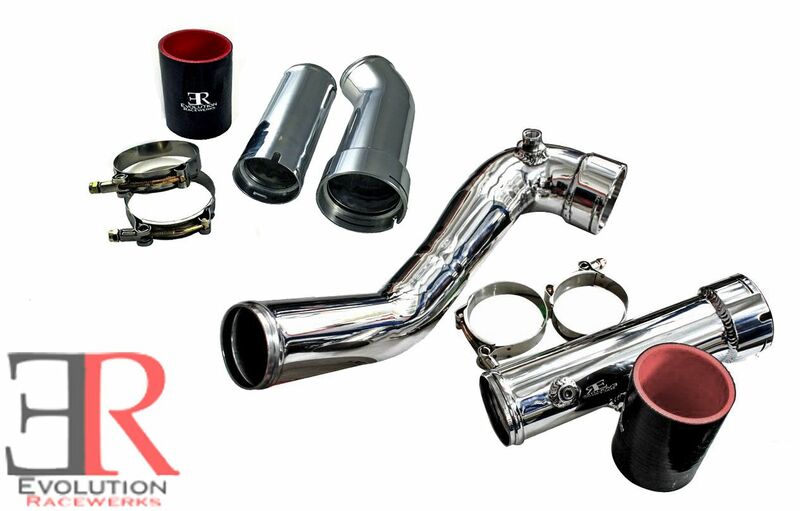 Pair it with ER's N20 Charge Pipes and have full metal hard piping in your entire intercooler system! 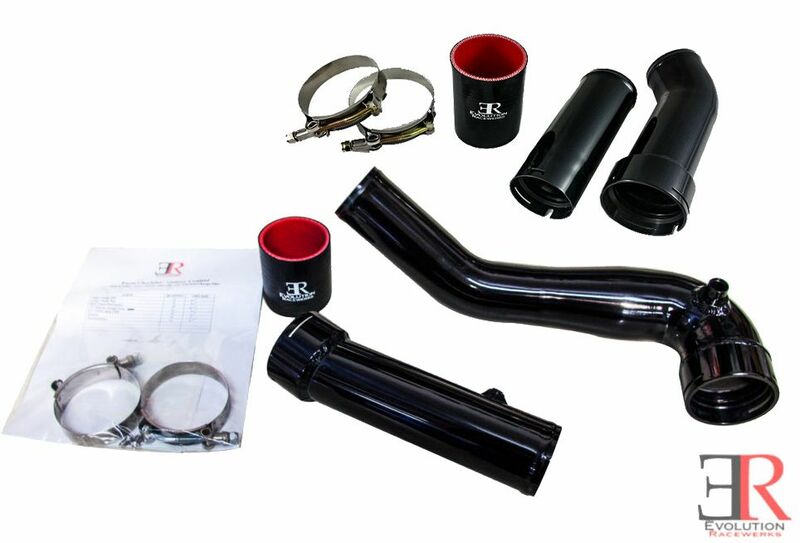 Take a look at your factory rubber charge pipe that runs from the turbocharger to your intercooler. Grab it and squeeze the rubber hose and you will be surprised how easily it collapses. Now, imagine how that charge pipe is under boost! Our new turbocharger to intercooler (TIC) charge pipe replaces that rubber hose with a new 6061 aluminum (lightweight) mandrel bent piping. Take a look at your factory rubber charge pipe that runs from the turbocharger to your intercooler. Grab it and squeeze the rubber hose and you will be surprised how easily it collapses. Now, imagine how that charge pipe is under boost! Our new turbocharger to intercooler (TIC) charge pipe replaces that rubber hose with a new 6061 aluminum (lightweight) mandrel bent piping. Often ignored, charged intake airflow characteristics greatly affect throttle response, turbo lag and ultimately maximum power potential. Smooth bends and minimal obstructions are ideal. Evolution Racewerks has finally released their N20 Charge Pipe! ModBargains is proud to have been one of the first to offer it to our customers. The Charge Pipe Upgrade Pipe is available in the same 2 finish. It is available in a mirror polish finish and is also available in Evolution Racewerks' Type III Hard Black Anodizing for the guys that want the stealthy, factory look. An added benefit of the Type III Hard Black Anodizing is that it hardens the aluminum piping and makes it more durable against accidental damage (like dropping the pipe). Often ignored, charged intake airflow characteristics greatly affect throttle response, turbo lag and ultimately maximum power potential. Smooth bends and minimal obstructions are ideal. ER used 6061 aluminum (lightweight) mandrel bent piping to ensure smooth transitions. The Turbo to Intercooler pipe features 2.5" piping to match up to the factory intercooler inlets (factory is 2.5"), ensuring maximum flow without obstruction.